I am loving peach season this year. The South Carolina peaches that we are getting in Charlotte seem extra sweet and have the perfect texture. As a result, there has been an endless supply of peaches in our house. I just can’t stop buying them because I know the season will be over soon. We really enjoyed the grilled peaches. 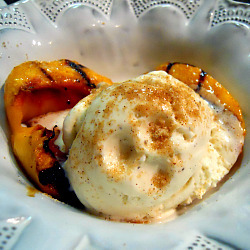 The brown sugar and cinnamon caramelize on the peaches and they get a very slight smoke flavor. This recipe would be a perfect side item or dessert.I will definitely be asking Brandon to throw some peaches on the grill again before peach season ends! Preheat grill to medium. Cut peaches in half, twist to separate and remove the pit. Mix together brown sugar and cinnamon and set aside. 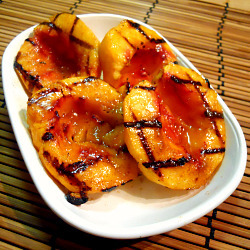 Brush peach halves with vegetable oil and grill (cut sides down) for 3-4 minutes with the lid down. Flip peaches over so that cut side is exposed and sprinkle with brown sugar/cinnamon mixture. Grill for another 3-4 minutes, lid down, until brown sugar mixture has caramelized. Serve as is or top with ice cream and sprinkle with more brown sugar.